In the framework of the Cassini-Huygens mission towards the Saturnian System, the Huygens Atmospheric Structure Instrument (HASI) is one of the six experiments on-board the Huygens probe. After being released by the Cassini spacecraft on 25 December 2004, the Huygens probe descended onto Titan, the largest moon of Saturn, on 14 January 2005. HASI is a multisensor package which has been designed to measure the physical quantities characterizing Titan's atmosphere during the Huygens descent and at the surface. There have been numerous ground based and balloon borne campaigns to verify the function of the radar altimeter units (RAU) on Huygens. Although not part of HASI, but rather a probe sub-system, the intermediate frequency of the radar altimeter receivers is processed by the radar altimeter electronics within HASI and downlinked within the HASI telemetry. The ground based tests, "sky tests", have been conducted to demonstrate that both the instrument's radars can operate simultaneously at maximum sensitivity without interference. 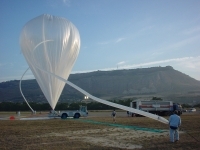 The balloon flights have shown that the radar altimeter can correctly function at a height of at least 33 km, which was a design goal that was never proven until then. HASI has been proposed as an international collaboration including 17 institutions from 11 countries. It has been funded by ASI and other European Institutes that provided hardware elements; Officine Galileo (OG - Alenia Difesa, Firenze, Italy) has been the industrial contractor.